This 4-star hotel offers modern rooms, an elegant restaurant and rooftop terrace with panoramic city views. 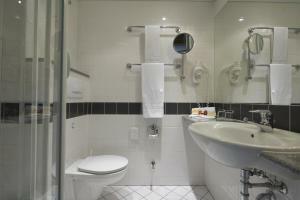 It is a 2-minute drive from Hamburg Central Station, Mönckebergstraße shopping mile and the Alster canal. All rooms at the InterCity Hotel Hamburg Hauptbahnhof have satellite TV with free SKY channels, air conditioning and soundproofed windows. Guests at the InterCity Hotel enjoy free use of Hamburg's public transport system. Buses, S-Bahn (city rail), underground and intercity train services operate from the nearby train station. On-site parking is available. A rich breakfast buffet is available each morning at the InterCity’s restaurant, with a direct view of the main railway station and Kunsthalle Art Gallery. Guests can enjoy seasonal and regional meals or a drink at the stylish bar.